Oh gosh, I'm the first one up this week and I'll already blowing it. But since I shared a bit about myself last week, I hope you'll give me grace for going off script with this week's theme about the music in our minds. See, I listen to no music during the day, other than maybe a bit of the radio while I pick up the kids or drive them to karate, or run errand. During that time, I prefer to listen to K-Love, but that's not because I necessarily love all the music - songs which get repeated, and repeated, and repeated . . . (ok, off soapbox). No, mainly it's because I don't trust the music on the other stations. 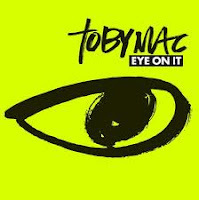 However, if I were to share the ONE song that I LOVE listening to over and over, it would be the one that I hear my son singing while tucked away in his room: TobyMac's "Favorite Song". He doesn't know I'm listening. I'm going to keep it that way. What an amazing sweet sound. Both my kids adore anything that Toby Mac puts out. And their Mom, who remembers DC Talk, rapped to Heaven-bound, and met a very young TobyMac yearsssssssssssss ago . . . approves. Ok, I could listen to him all day. I love the music, the words, the funk, the style. His music can turn my day around. No kidding. Hey, look how I just turned this blog post around from NO music to SOME music! Ta-da!